Worm breeder boxes - which size is correct? That's a 4 gallon bin by Sterilite. I wanted to ask if you thought that may be too small? They also have a 10 gallon, which is the same depth (about 7.5") but is longer and wider. Would that be a better size? Also, I see you gave instructions to build the stacking worm farms to sell, but I wasn't clear if that was how you also set up your breeder boxes? Or do you just keep those in a single bin, with holes to aerate? I am wanting to divide up my "herd" into new breeder boxes from the bin they are in now, so whatever information you could provide would be much appreciated. Thank you. Let me answer your questions for you. I generally like my breeder boxes to be at least 10'' deep but as I said your suggested boxes should be fine too. If you want to focus on only one size of box remember that the amount of worms a bin can support is mainly depending on it's surface area. So the larger the surface area of your bin the more mature worms if will be able to hold. 2. Over the years I have used many different bins as breeder boxes, from barrels to buckets and all kinds of bins. For economical reasons (space) I preferred the stackable bins the most. I had over 100 stacked breeder boxes in a single garage... I will attach some pictures of breeder boxes we used to this message. So you can basically use whatever boxes you can get your hand on as long as they fall roughly within the parameters I described in my book but one point to remember with is the fact that African Nightcrawlers like to explore the environment. 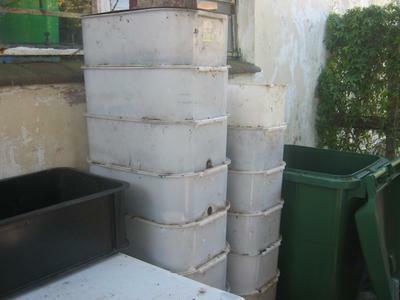 In order to prevent them from leaving your breeder bins you should always get bins with lids and ideally place a light above the boxes which will discourage the worms to crawl out. I trust this will clarify things for you. I wish you lots of success with your worm business venture. Keep me posted on your progress and please feel free to contact me if you have any further questions or suggestions.